Valentine's Day symbolizes love, Flowers on this special day have always been a necessity when it comes to letting someone know just how much they matter. But what if your man is just isn't the biggest fan of flowers? After all, they could be allergic or they're just not about the maintenance that comes with a floral bouquet. But is there an alternative for those who hesitate to recive flowers on the V - Day? Yes, Luckily you do have an option the best way for those who are not too fond of flowers is -plants! Not only they are great for making your space a bit brighter, houseplants just bring in that much needed freshness into our lives. Needless to say, plant gifts are the way to go, and here's 5 of our picks for romantic house plants that are sure to sweep your recipient off their feet.. The name it self has it... This plant is mainly for its charming purple flowers and its delightful fragnance ( and not to mention, it makes some of the best floral teas), but who knew that they could make such a romantic gift as well? If your man is anticipating the transition from winter to spring, a pot of lavender is the perfect welcome for the upcoming colorful months. The maintenance for lavender is actually quite simple thing. Just watering once or twice a month and placing them in a spot with good amount of light will have them freshening up your loved one's home for months and months to come! One of the beautiful tropical flowering plants, gift your loved one to relive their favourite island getaway feel. This plant is sure to have them reminisce about some of their best moments in life! Anthuriums are unique, bright houseplant with waxy, colorful blooms. You can probably find them in shades of red, white, or even pink, making them nothing short of romantic- they're even shaped like a heart! 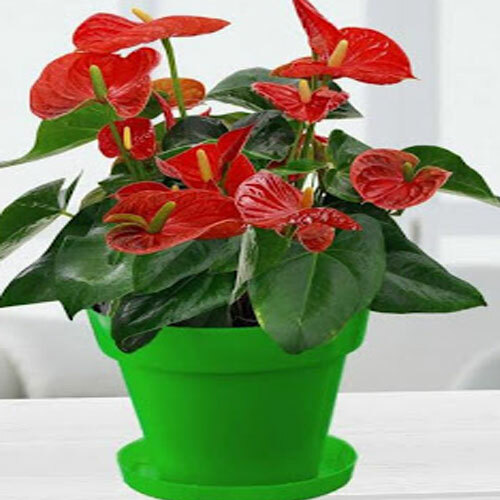 As Anthuriums are tropical plants they are definitely supposed to be raised in warm and humid environment Placing them in shower room is the best option if your live in drier climate. Be sure to water them twice a week for the best growth results. Jasmine plants have been in spotlight for their sweet smelling flowers, but, they're also known for being a symbol of love in countries such as Thailand and the Phillippines! Their white, waxy, star shaped flowers never fail to convey that sweet message you've been meaning to get across to your special someone. With proper care you guy can have their jasmine plant gracing their home all year around. They just nee dto place their new potted friend in a spot with plenty of sunlight during the spring and summer seasons; this is because those months are peak bloom for jasmine flowers. Indoor temperatures should also be kept warm and slightly humid since these greens are actually tropical plants too- the more you know! If you really want to Impress your significant other and let them know how you feel about them all in one go, then this sweetheart cactus is probably the cutest way to do so! with it's nickname as the Valentine plant, it's almost as though this wax, hearty-shaped succulent was made for all this holiday. No plant lover's day is complete without a potted orchid on display! With their elagant, soft colored petals, it's almost too hard to resist this plant's charm. They are also just perfect for any love - filled holiday because of their symbolic value- depending on the color of their blooms, you will most likely be sending along some sweet and romantic messages! Luckily for all of us, Orchids are pretty simple to care for! your recipient just need to make sure their new potted friend is placed in a well- lit corner and watered enough to thrive. Because these greens are categorized as tropical plants, they do require a bit more humidity. But actually, a daily misting of your blooms should help mimic a nice, humid environment for any indoor orchid plant.